In Moneyball, Michael Lewis explained how the Oakland A's, with a very low payroll, optimized wins by finding market inefficiencies. Baseball historically focused on metrics like batting average and runs batted in. Oakland focused on "on base percentage" and "slugging percentage", finding athletes who generated good outcomes in these metrics at lower-than-average salaries. In other words, the existing best practice was to find great athletes with good batting averages and an ability to drive in runs. Oakland identified a different set of metrics, and then found players who were good at generating these metrics at a low cost. Oakland won a ton of games from 1999 - 2006, using this methodology. In Online Marketing, we look to optimize conversion rate, and we have the best set of tools we've ever had to do this style of optimization. But we're not making big strides in understanding how to increase customer spend over time. In other words, we work really hard to increase conversion rates, maybe from 4.1% to 4.5%. But we somehow aren't able to engage customers in a way that increases loyalty. E-commerce sales have largely grown from traffic, not from increases in repurchase rates, orders per buyer, items per order, or price per item. In the future, growth must come from increases in repurchase rate, orders per buyer, items per order, and price per item. So if you are an online marketer, I'm going to encourage you to evolve your thinking. I'm not going to ask you to abandon all of the metrics and optimization strategies you've historically employed. I am going to ask you to think differently. Let's start by defining a metric. 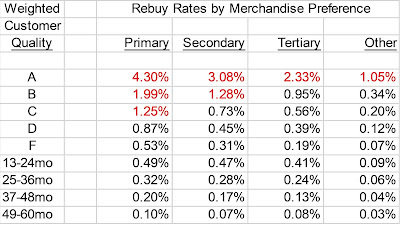 The name of the metric is "Repurchase Rate". Simply put, this metric is defined as the percentage of customers who purchased last year, and then purchase again this year. Now if your business is not an e-commerce business, then go ahead an think about whatever the "action" is that you want to maximize --- if you are Twitter, you might look at a "Re-Use Rate", how many people use your service again today, given that they used your service yesterday. Customer #1: Visit 2/1/2008, Visit 2/8/2008, Visit and Buy 2/12/2008, Visit 7/1/2008, Visit and Buy 7/2/2008, Visit 9/10/2008, Visit 10/1/2008, Visit 12/1/2008. Customer #2: Visit and Buy 2/15/2008, Visit and Buy 7/2/2008, Visit 12/1/2008. Both of these customers have a 100% "Repurchase Rate", and both customers ordered two times during 2008. Both customers last visited the website on 12/1/2008. In many ways, both customers yield the same outcome --- both customers purchased twice during 2008. But from a "Conversion Rate" standpoint, these customers are very different. Customer #1 has a much lower conversion rate than does Customer #2. Our web analytics tools are often configured to favor Customer #2. When we favor Customer #2, we favor the actions that cause Customer #2 to come to our website. And as a result, we will spend more money, via optimization, on the actions that generate a lot of customers who look like Customer #2. So my thesis is this: Why not look for the actions that generate customers who have good Repurchase Rates? 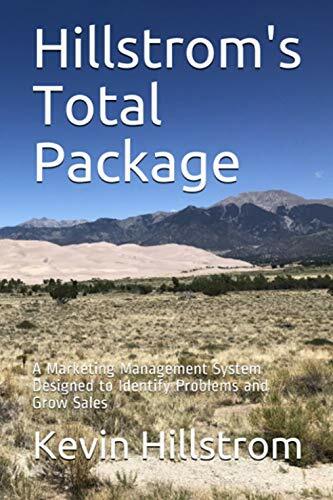 By optimizing "Repurchase Rate", a metric measured across a multi-month or multi-year period of time, we find customers who may look bad when measured via "Conversion Rate", but are equally or more valuable to the long-term health of the business. In other words, there is a market inefficiency that exists when everybody focuses on "Conversion Rate". By instead focusing on "Repurchase Rate", we identify customers who appear to be poor converters, but spend the same amount in the future as do other customer who convert well. The secret is that we can grow our business faster than our competition, because we are optimizing on a different set of measures. Next week, we'll begin to explore the math that allows us to optimize via "Repurchase Rate". The math will lead us to a simulation environment that helps us understand the long-term impact of short-term decisions. At some point you still have to tie back to profit in order to really maximize the business. Ultimately profit is what matters. In practical terms there are still a lot of questions. First, this is different than baseball since we aren't buying individual tactics that no other team can use. In other words, if we hit something that works, everyone else can use it as well (same player). Am I missing something? Second, if I focus on repurchase rate, how do I actually optimize my site. I'm guessing that PPC visitors have a lower repurchase rate. Frankly, I can't lower my spend there, since these are profitable (for some, very profitable) customers. Maybe I find that Twitter sends visitors with a high repurchase rate. Or email. It's still difficult to really affect this number without a million tests that look very much like tests to increase conversion rate. Make sense? Personally, I'll start tracking this and try to determine how my decisions would be different from decisions to maximize conversion rates. I'll let you know if I find anything earth-shattering. Just don't tell the other teams . . . I don't disagree with much of what you said ... that's why it will take me a month or two to get from conversion rate to repurchase rate to demand to profit measured in a simulation environment. In baseball, the methodology was available for everybody else to use ... and once other started to use the methodology, the competitive advantage was gone. That's where I'll head with this ... there is a methodology that, if used, will yield better results (until others begin to use it). The methodology will be explained here in August & September. Maybe folks will find it interesting, maybe folks will not find it interesting, we'll see!